Making dumplings at home is an engaging affair. On a weekend for brunch or on a lazy afternoon with all the ladies gather around the table. Our little assembly line. Each one with a task to fulfill before passing on to the next. Dividing the dough, the clanking sound of rolling out the wrappers, the repeating motion of folding and pleating turning them into bite-ful wonders. Taking breaks to fry, steam and boil them. Dunking them into the gingery vinegar before popping the juicy steaming pocket into our mouths. We continue to assembly line once the plate is emptied. There's always lots left and each one will end up with a least a tray to take home, to be frozen up for any meal down to week. This was how it used to be, spending a morning or afternoon with the Shanghainese ladies. Nothing beats a homemade dumpling. 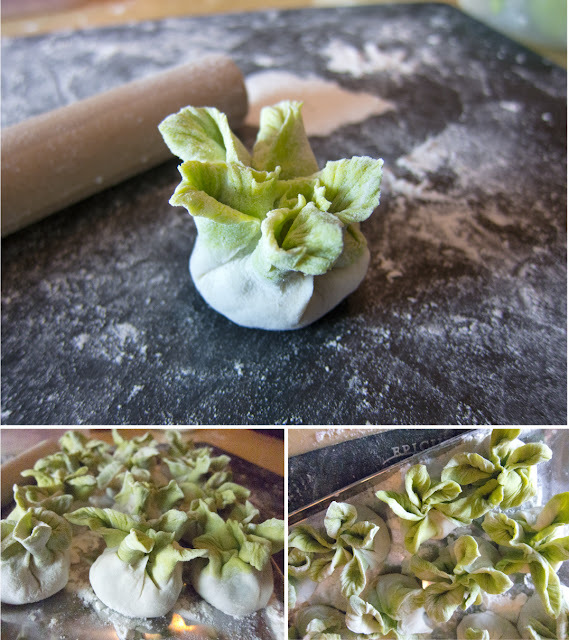 Making dumplings reminds me a little of origami. Once you grasp the basic, they can be quite creative. Folded into different shapes and size, let alone the filling combination. From gourmet wagyu mince with kimchi to humble vegan or simply the basic pork and cabbage version. It can be very colorful as well using vegetable juice as color- spinach green, carrot orange to red cabbage purple or perhaps a rainbow version. It sure to be healthy and kid pleasing. 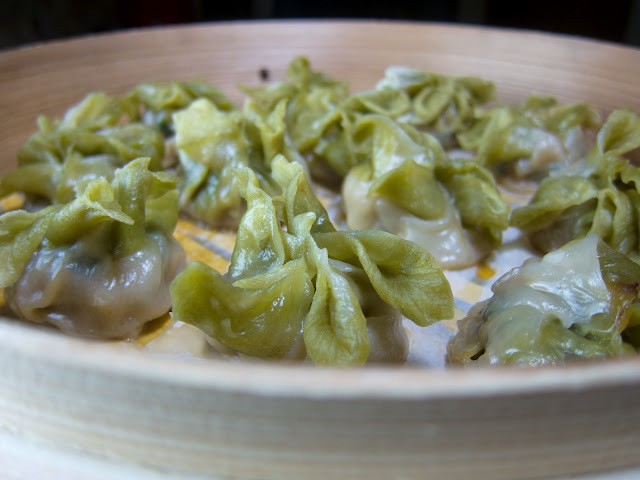 Chinese dumplings, consist of a filling, generally a ground meat, that is wrapped in a thin wrapper and sealed by pressing the edges together or by crimping and they are commonly served with a dipping sauce. The dumplings can be cooked by frying them, steaming them or boiling them. In Shanghai, they are usually eaten as snacks or part of a staple at the end of dinner to fill you up. I've made the dumplings shaped in bok choy. It's so cute and such a joy to make. Perfect when you want to show-off your culinary skills at a chinese dinner party, however, it takes longer and requires some practice but once you get the hang of it, it be a breeze. Join me if you want to learn the basics of dumplings making. I'll be sharing the basics dumplings making from May onwards at Palate Sensations. Get your girls ready at the assembly line for Dumpling Party. Roughly mix all the ingredients together and let it sit covered for 20mins. Then knead together until smooth for 10 mins. Adjust with more water or flour. Let the dough rest for 30mins. Take half the dough and roll into a log. Portion to about 10g balls. On a well floured surface, flattened ball with palm and roll with a small rolling pin to about ⅛ inch thick circle (alternatively, you cut cut the wrapper with a circular cutter to make perfect rounds). Dust it liberally with flour, set aside covered. Continue with the remaining dough. The wrapper can be refrigerated wrapped in plastic wrap until required. Mix dipping sauce ingredients together and let it marinate for 1-2 hrs. Remove the garlic before serving. To prepare the spinach, blanch in salted water until just wilted and immediately transfer to an ice bath. Drain spinach and squeeze out excess water. Roughly chop the spinach. In a deep bowl. Add the pork, shrimps, spinach and the chopped chives. Mix the marinate together except the soup jelly. Using a spoon, Stir in one direction for about 10 mins to tenderize the meat and help the mixture stick together. The meat should be a little bouncy and sticky in the end. Refrigerate for 30 mins. Have a small bowl of cold water ready. Lay a dumpling wrapper on a dry work surface, and place a teaspoon of the meat mixture in the center of the wrapper. With a fingertip moistened with water, trace a line along half of the edge of the round wrapper. Fold the wrapper over to enclose the filling, and pinch the wrapper in the center to seal the edges together at that spot. Holding the filled half-circle in the left hand, pleat the top of the wrapper from the middle out, pressing it to the flat edge of the wrapper at the back. You can either boil (boil till it floats) or steam in a bamboo steamer for 10 mins. Serve the dumplings hot accompanied by the dipping sauce. You will need a portion white and green dough. Roll green dough flat to about ¼ inch. Roll the white dough into a log, then wrap the green dough over. Roll further into a log and divide by cutting it into portions. Have a small bowl of cold water ready. Lay a dumpling wrapper on a dry work surface, and place a teaspoon of the meat mixture in the center of the wrapper. With a fingertip moistened with water, trace a line along half of the edge of the round wrapper. Shape and squeeze 5 corners. Thin out the corners with fingers and fray it with your finger tips to resemble to leaves. 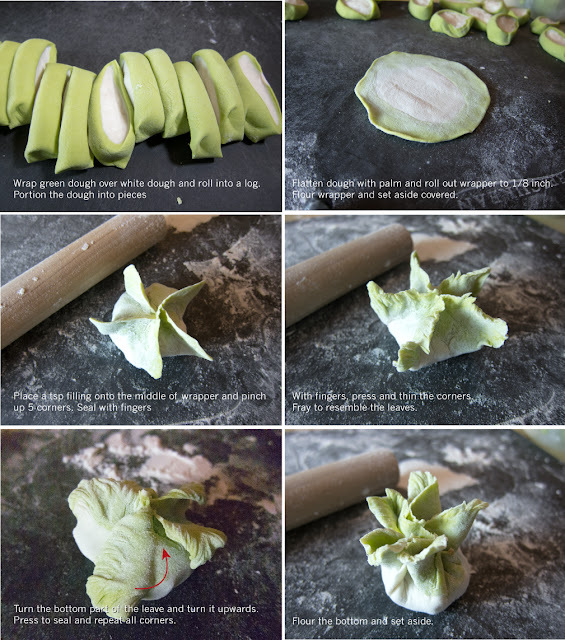 Fold up the base of the leaf and pull each section up to the top. Press together to seal. 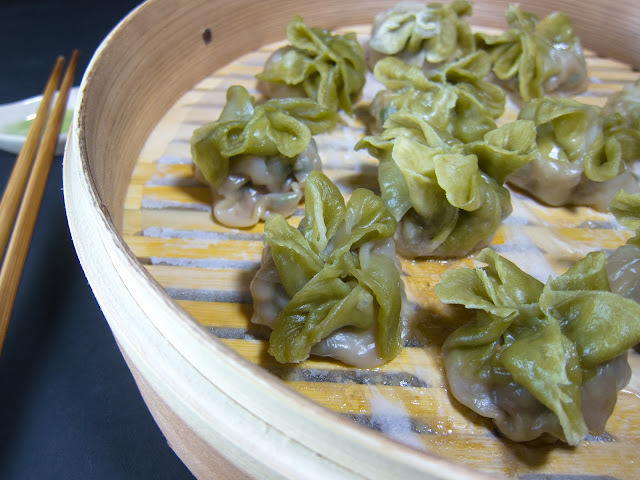 Lay the dumplings on a bamboo steamer and steam for 10mins. Serve the dumplings hot accompanied by the dipping sauce. 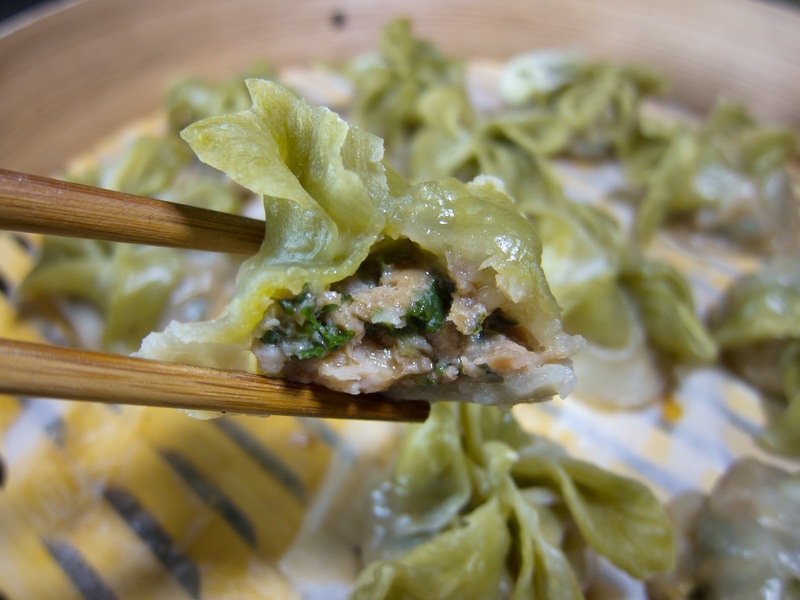 Once assembled, the dumplings can be covered with plastic wrap and refrigerated for several hours (make sure they are dusted well to prevent sticking); they can be cooked straight from the refrigerator. For longer storage, freeze them on their baking sheet until hard (about 1 hour), transfer them to a zip-top freezer bag, seal well, and keep them frozen for up to 1 month; partially thaw, using your finger to smooth over any cracks that may have formed during freezing, before cooking.